By the time of the meeting others of a like mind had come forward to support the cause including the Surrey Amphibians and Reptile Group (SARG) and the Friends of Farnham Park and they greatly strengthened our team on that day and ever since. The meeting was well attended and there was a good discussion with unanimous support for forming a partnership. This will enable a better focus for conservation effort in Farnham with a vision of making it a national example of biodiversity management in an urban environment. This is a bold step to take for a mainly volunteer enterprise because most previous BAPs in other places have been drawn up by local authorities. We are very proud of having started this move in Farnham but fully realise the challenge it presents. 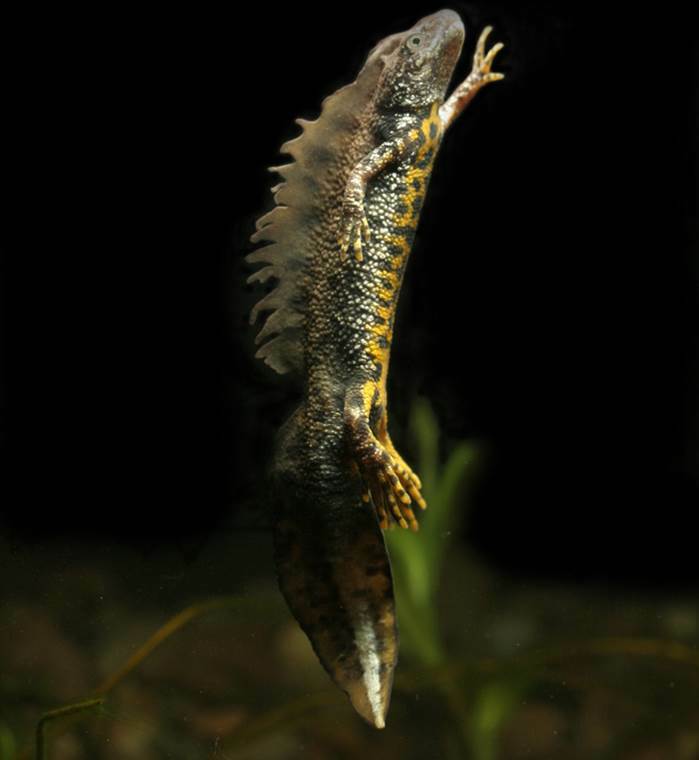 The great crested newt pictured here is in global decline and highly protected in UK law. There is a population in Farnham and it is important to conserve this and to try to enhance number This would also assist other aquatic species such as newts, frogs and toads which are also suffering problems through disease and habitat loss. Since the successful meeting we have been working with representatives of the other groups mentioned above to lay firm foundations for a long term project. This deserves careful consideration and it is taking longer than we thought. However, significant progress has already been made. There is already a new website for the FBG at http://surrey-arg.org.uk/FarnhamBAP/ which, in addition to news items, includes short biographies of the current management team and administrative notices such as the Policy to be adopted for safeguarding personal data. Data handling is going to be a very important subject in the project because the initial step to be taken is to draw up a knowledge base of species and habitats in Farnham which currently does not exist. Already data has started to come in and progress is being made on expanding the information we hold on our list of 100 green spaces in the town. One innovative feature of the approach to the Farnham BAP is to include private gardens. These occupy about a third of the area of the town and certainly help to support wildlife and to enhance the green corridors. Yet, little is known about the flora and fauna they contain. To trigger this sub-project of the BAP work a Garden Questionnaire will be launched as quickly as possible. The model for this will be the similar survey BCG made in 2013 but there will be greater focus on the detail of the wildlife the gardeners have seen. Time has also been taken to set up a structure for the Group which best meets the demands of this long- term project as well as looking after the interests of all the partners. As a result a Community Interest Company (CIC) is to be established to provide the resilience needed. This structure minimises administration, creates a recognised legal entity which will enable such things as data sharing agreements to be made, and will limit the financial liability of all members. It is shown on the left side of the diagram below. In effect the CIC is a legal wrapper for the core project: the Farnham Biodiversity Partnership. Its members are in fact the small number of individuals who are prepared to become its Directors. 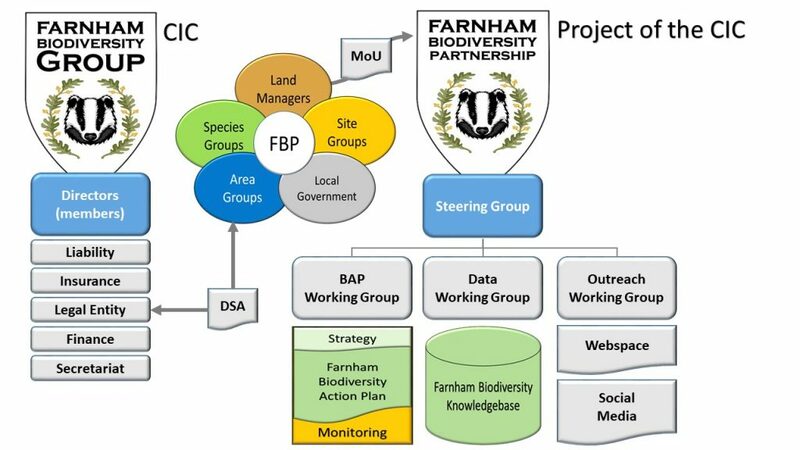 Responsibility for generating the BAP will rest with the Farnham Biodiversity Partnership, working through a Steering Committee as shown in the centre of the diagram. For reasons of good administration and continuity, partners will be loosely tied into this by a Memorandum of Understanding (MOU). This is an important project for Farnham and psychologically it should be very good for BCG members to feel they are part of it. But how will it work? The expectation is that all groups will endeavour to advance the project to the best of their ability, but there is no legal requirement for them to do anything. They can do as much or as little as they wish, dependent on their resources and other commitments. In the first instance the main task is to develop the BAP. That means creating a knowledge base of species and habitats for all of Farnham. This will involve data collection and management and perhaps some surveys to fill in gaps. There will be little for BCG as a group to do on that but we hope all members will participate in the Garden Survey. After assessment the Plan will begin to emerge and out of that will come tasks. If appropriate these may be undertaken by partners or possibly under contract. Hypothetically, if we decided to undertake work in Monks Walk Wood – a massive task- then we might get some help from the Partnership since ancient woodland will undoubtedly be viewed as an important habitat.